Sleeper awake! One of the great sleepers of modern literature but so rarely encountered that I have no real qualms about rousing it from slumber. The last copy I heard of was three years ago on a Maggs catalogue of the library of the much missed gentleman publisher (and runner) Alan Clodd. £1200 was being asked and appears to have been achieved. The book is by the New Jersey born composer George Antheil (1900-1959) under the pseudonym Stacey Bishop. Self proclaimed 'Bad Boy of Music', championed by Ezra Pound, composer of over 30 Hollywood film scores, including the much rated Dementia (1955) and practicing “endocrine criminologist” he also wrote this scarce detective novel published by Faber (under the auspices of T.S. Eliot) in 1930. The story behind the writing of the book goes something like this: from 1927 to 1933 Antheil lived variously in Vienna, Tunis, and Cagnes-sur-Mer, writing opera and stage works for productions in Vienna and Frankfurt; in 1929 he was summering in Rapallo, Italy something of an ex-pat artists colony. That year T.S. Eliot, Ezra Pound and W. B. Yeats came through and also the German writers Gerhart Hauptmann and Franz Werfel. All of these writers are said to have had a hand in the work, with some final editing done by Eliot for the London Faber edition. Antheil had been surprised to see that off-duty these highbrow writers tended to read detective writers such as Dorothy L. Sayers. Antheil had an interest in criminology through theories he had developed about the thymus gland and endocrinology in crime detection. So serious was Antheil’s belief in endocrinology that it is said the Parisian police made him an honorary lifetime member. 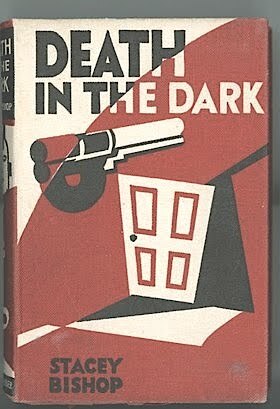 Antheil assured the assembled authors that he could write a detective story as good as anything they were reading and Death in the Dark was the result. Theoretically it should be a C item in the bibliographies of Pound, Eliot, Yeats, Hauptmann and Werfel as they are all said to have helped with its writing. The book's hero Stephen Bayard was based on Pound. Despite the involvement of 2 Nobel Prize winners and Il miglior fabbro himself the book is generally considered almost unreadable. I have always associated Rapallo with Max Beerbohm and would like to think he also dropped by to add a whimsical chapter. The book was issued without a jacket (possibly a glassine wrap may have existed) with very attractive pictorial boards - one of only two books issued in this way by Faber, the other being Bruce Hamilton's To Be Hanged - A Story of Murder, a rather scarce thriller dedicated to Patrick Hamilton, the author's brother, and worth about £200, possibly more if very sharp. Faber illustrate the Antheil book on their Flickr page , can find no image of To Be Hanged. As for content the British Museum have the book under these categories 'Private investigators — New York (State) — New York — Fiction -- Murder — Investigation — Fiction.' It has not been reprinted. The fascinating story around it more than outweighs its supposed unreadability and it may be a good investment, although a deep academic analysis of its genesis could affect prices -up or down. It has to be admitted some of the information about the book comes from Antheil himself and book-dealers whose enthusiasm may outweigh their scholarship. 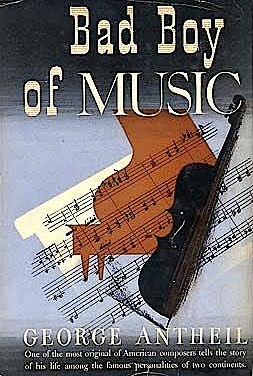 A much cheaper book is his Bad Boy of Music (Doubleday, Doran, Garden City, 1945) nice jacketed copies of which can be had for less than $100. He considered himself an expert on female endocrinology, and wrote a series of articles about how to determine the availability of women based on glandular effects on their appearance, with titles such as The Gla ndbook for the Questing Male. 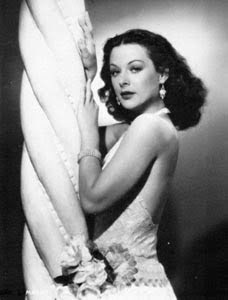 Antheil's interest in this area brought him into contact with the actress Hedy Lamarr, who sought his advice about how she might enhance her upper torso. He suggested glandular extracts, but their conversation then moved on to torpedoes. Lamarr (right) had fled her Austrian munitions-making husband, and coming to the US had become fiercely pro-American. Together they conceived and patented a frequency-hopping torpedo guidance system: Lamarr contributed the knowledge of torpedo control gained from her husband and Antheil a method of controlling the spread spectrum sequences using a player-piano mechanism similar to those used in the Ballet Méchanique. Despite the initial enthusiasm of the U.S. Navy, the invention received little attention at first; and the importance of Antheil and Lamarr's discovery was only acknowledged in the 1990s. Haven't read the book - but would this be good background music ?